Astigmatic Presbyopia – the end of the road or a pot of gold? Excitement or fear? Which of these 2 polarising emotions do you experience when that “dreaded” patient walks into the practice – with an astigmatism and either approaching, or properly ensconced in presbyopia… and this challenge is only going to get bigger and bigger as time goes by as our populations continue to age. 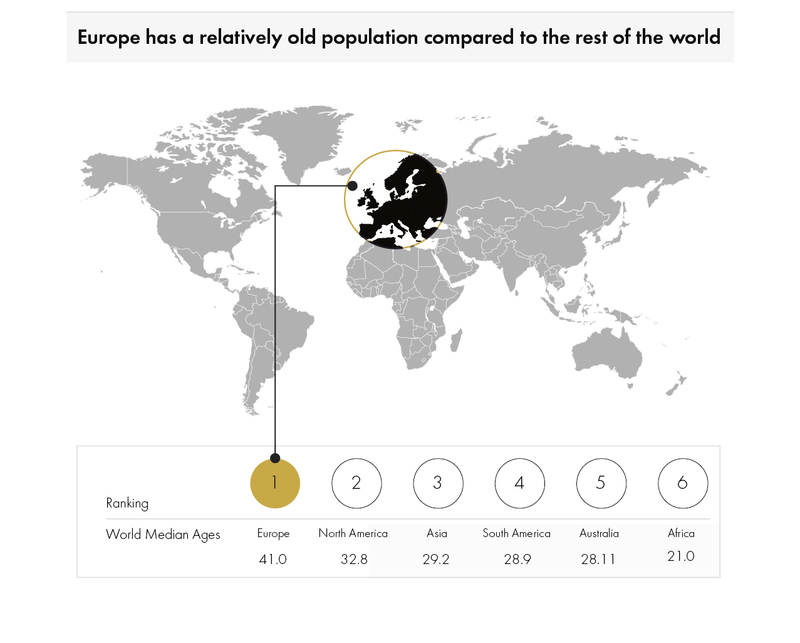 In fact, Europe has a pretty old population when compared to the rest of the world – with an average age of 41 compared to only 32.8 in the USA, and 28.11 in Australia, and projecting to be approximately 45 in 2045, we find ourselves in right at the gateway to presbyopia and staying there for a long time to come. So what does this mean? Well, for contact lenses it represents an enormous opportunity – both clinically and commercially. Get it right, and patient retention and loyalty is set to stay with you for many years, and this means greater revenue protection in your practice, and importantly, happy patients for a long time. But how many of your patients do you hit the ace for in presbyopia, especially if they are also astigmatic? How much of the revenue opportunity is lost with patients dropping out of your practice at this life stage? Prescribe monovision toric lenses, and then hope to get away with it for as long as possible, or hope that presbyopia doesn’t progress too far too quickly. However, the patient is likely to experience more and more compromises such as lack of binocular vision or working distance issues as the add increases. Correct for distance, and then prescribe reading glasses over their contact lens prescription, although not every patient is happy with having to compromise in this way. Or failing all that, let the patient gently know that they have had a good run, but now their contact lens journey is over. And even with those coping strategies mentioned above, how long do they really work for? As presbyopia progresses, as their vision needs evolve, how equipped are we really to be able to adapt and evolve the prescription to keep up with them? Do our patients really tell us the whole truth when the suggestion of “no more lenses” might be a risk.. until it really doesn’t work. Or worse yet, they might seek out another eye care professional for a second opinion, therefore heightening the risk of substantial lost business. But what if we could do better? What if we had micro-precision steps in additions to evolve the prescription gently? 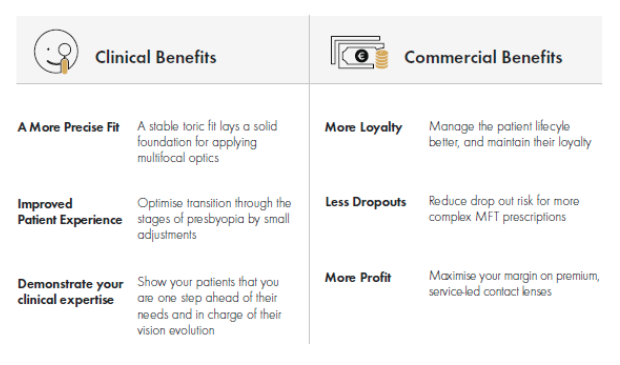 What if we could ensure a stable and well fitting toric lens, and then place multifocal optics over the top with a choice of 15 adds and designs in centre-near, centre-distance and a team of clinicians on the phone eager to support you in choosing amongst all these options effectively and efficiently. What could the impact be to the practice. Well first, clinical brilliance. A leader in vision in the local area. No matter what the patients vision needs, a practice that can solve it, and tackle the most complex visual requirements. Second, commercial reward. If you can meet the needs of patients better than ever before, even exceed their expectations beyond previous beliefs, then the cash investment in paying for the service received becomes a normality. And what’s more, if you can adjust the prescription, constantly staying one step ahead of your patients visual needs, then you are almost certainly guaranteed a loyal patient, one that probably bring his or her family down too, with the obvious commercial benefit that that brings. At mark’ennovy we are absolutely passionate about fitting the right lens to the patient, and meeting their every vision need. We believe in fit-first – ensure a well-fitting contact lens on the eye, and in the case of torics, highly stable too, and once achieved, it is just a case of placing the optics on the lens. And depending on what stage of presbyopia the patient is at, taking a little time to adjust the patient to the multi focal optics. For example, take Jenny*, a 39 year old young professional, astigmatic, but not yet presbyopic. Fitting her now with a mark’ennovy toric contact lens means that you have a stable, comfortable contact lens already on the eye, so that at the very first sign of presbyopia, all you need to do is place an 0.50 add on the lens. And as she progresses through presbyopia, you can evolve the prescription with her needs. Or take John*, a 51 year old lorry driver, astigmatic and already fairly well advanced in his presbyopia. He absolutely needs to be able to see for distance in order to drive, but doesn’t want to compromise his near vision either as he likes to read on breaks or catch up on emails and social media. Ensuring a stable toric lens to begin with, you can then correct for distance with 2 centre-distance lenses. After a month, once John has adapted to the multifocal optics, you may want to bring in his near vision with a centre-near lens in order to get rid of the ready readers. Stability First – Multifocal optics have no chance of working without a stable lens to begin with… Therefore make that extra focus on “fit first” – a nice stable and central fit with the right base curve and diameter for the patient. It is worth it!! You can read more on our site about the unrivalled combination of parameters, geometries and materials to help you meet virtually any patient need. Click here for more information. mark’ennovy is dedicated to the eye care professional. That’s why we have Opticians on the phone, and why we only sell through eye care professionals. We want you to be rewarded for your clinical expertise. * Both Jenny and John are fictitious people written for the purpose of article illustration.